After a few months of not shooting another LEO challenged me and others to what he called a "hot brass challenge". I had changed out the stock .160 height M&P front sight for a shorter .140 height one from Dawson Precision and went straight to the 25 yard line. Now I have POA=POI which is great for me. The challenge is an effort to get some folks out to the range...it got me back on the range and back to planning range sessions. In the video you can see that I am rushing the 25 yard shots. The pistol will shoot better than this...I just need to s-l-o-w down. 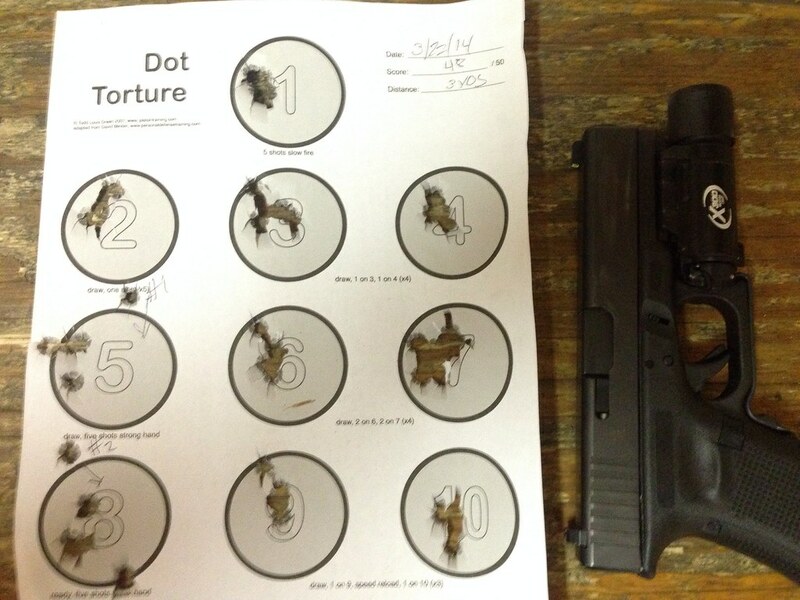 I think that dry fire and some dot torture drills will clean up the distance shooting. There is some good advise in this thread. 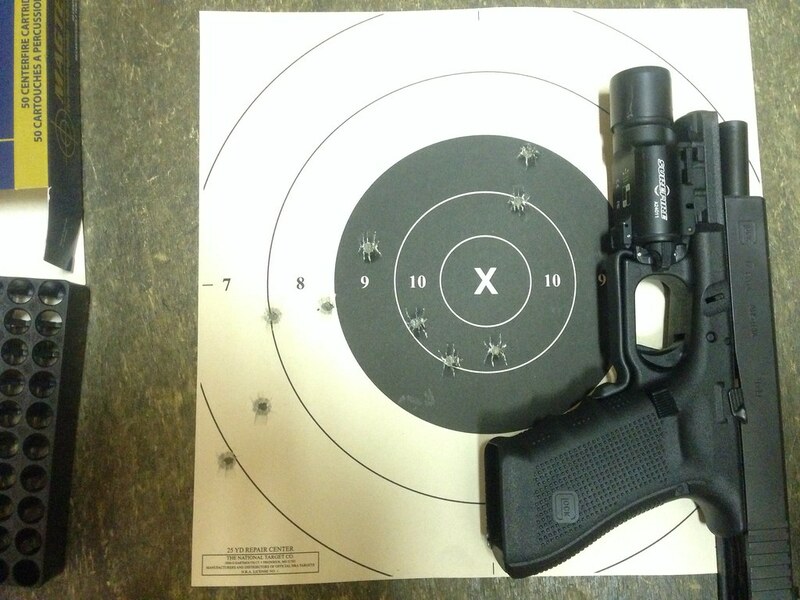 I'd add the best way to improve at 25 yards (and beyond) is shoot more at that distance. Little things show up at distance that are not so apparent at 7 yards. Random ball and dummy just shows that you flinch (flinch and other bad stuff), but doesn't cause you to stop flinching. Ball, dummy, ball, dummy allows you to press the trigger without fear of overpressure every other shot, and in Bill's experience brings results faster. I like the concept - I think it would encourage the shooter to maintain sight focus/ tracking and better be able to see what they are doing on the dummy strikes. Something no one has brought up but is very important to group shooting: sight picture. I set up my bullseye/ Bianchi Cup guns for a six o'clock hold on the x-ring at 25 yards. I want to be able to see all the black over my front sight when I'm shooting at it. I feel like this gives me better feedback on the front sight and it's relation to the target. Do you think a light colored B-8 sized target would accomplish the same thing For those who don't have the option of changing zero? I.e. seeing the sight picture better than on a black bull? The problem for advanced shooters is that many observes can't tell the difference between pre- and post-ignition push. For advanced shooters, the first/second is a good way to encourage consistency. I have mixed feelings about this. On one hand, I get that proper bullseye is not rapid fire. On the other hand, if it takes me 20 or 30 seconds to break a shot with a service pistol, it doesn't feel like a skill that I would be able to use gaming or real world. I aim (sorry) for a happy medium of shooting at a slow enough pace to make good hits but at a speed that it is likely to be useful. I may have missed this in the other comments. If so I apologize in advance. 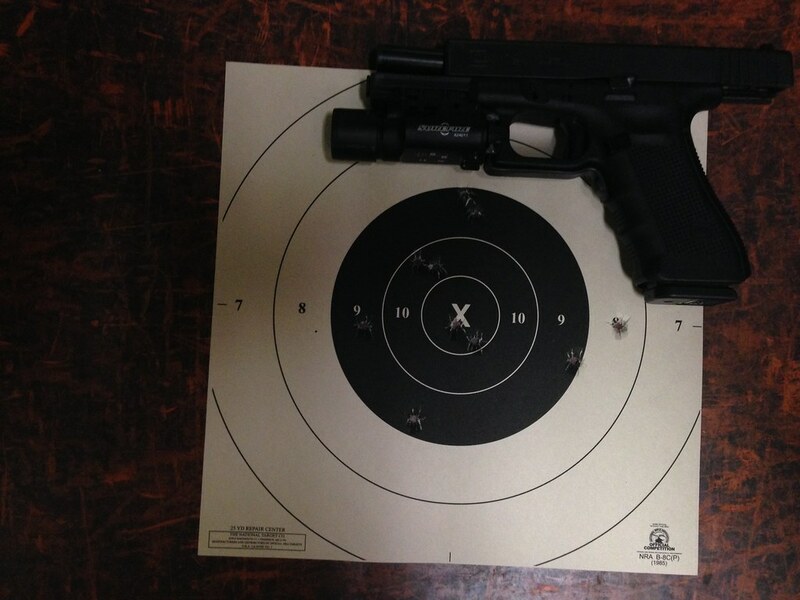 Have you benched the pistol or shot from a rest at 25 yards? Do you know the inherent accuracy at that range with whatever ammo you're using? The 6 o'clock hold that Caleb referenced makes a huge difference at longer ranges when one can't see the target at all with a wide front sight. Also I noticed it was mentioned that minor differences at 10 and 15 yards become major differences at 25 yards. Bench testing the pistol will let you know what to look at, is it the gun, ammo, you? Also keep in mind that a pistol that holds a 3" group at 25 yards can have an extreme spread of 6". Add the wobble factor to that extreme spread and those groups can get very large, very fast. I wish I could actually shoot the pistol from a bench. I've never been able to do well at all with any pistol from a bench. My offhand groups are always better. I've also shot better groups at 25 with this pistol/ammo. I was just surprised at how bad this one was, especially compared to decent groups at 10 and 15. Obviously something I'm doing is falling apart. Another significant issue is that a decent shooter can get away with a target or mid-range focus at 15 and closer and still turn in ok groups. Once you get further away it is very common for non-bullseye shooters to repeatedly change focus from front sight to target and back again, which fatigues the eye, which leads to lazy focus.